Traditional sanitation models – flush toilets – require a reliable water source and sewage infrastructure, both of which can be cost prohibitive and infeasible to build in urban settlements with contested land tenure. The usual alternatives, onsite systems like pit latrines and septic tanks, are also infeasible or unsafe in many urban areas due to space limitations, high water tables, and population density. With the population of urban areas set to double by 2050 and one in three people still lacking access to a toilet worldwide, interest in container-based sanitation models (CBS) as a viable sanitation alternative for cities is rapidly growing. Container-based toilets capture human waste in sealable containers that are then transported to off-site waste treatment facilities. This enables the provision of dignified and safe sanitation to vulnerable urban communities across the world, regardless of the presence of a water source or municipal-level sanitation infrastructure. Container based sanitation solutions, which SOIL’s EkoLakay program is pioneering in Haiti, are also less vulnerable to flooding and drought than pit latrines and septic tanks. Climate change is already increasing the variability in the frequency and intensity of rainfall, with both flooding and water shortages anticipated to become even more prevalent in the future. Without the drastic carbon emissions reductions required, studies suggest that sea levels will rise by at least four feet by the end of the century. Because nearly one-third of the world’s cities are on the coast, it’s more critical now than ever before to implement innovative, accessible, and climate-resistant sanitation solutions. 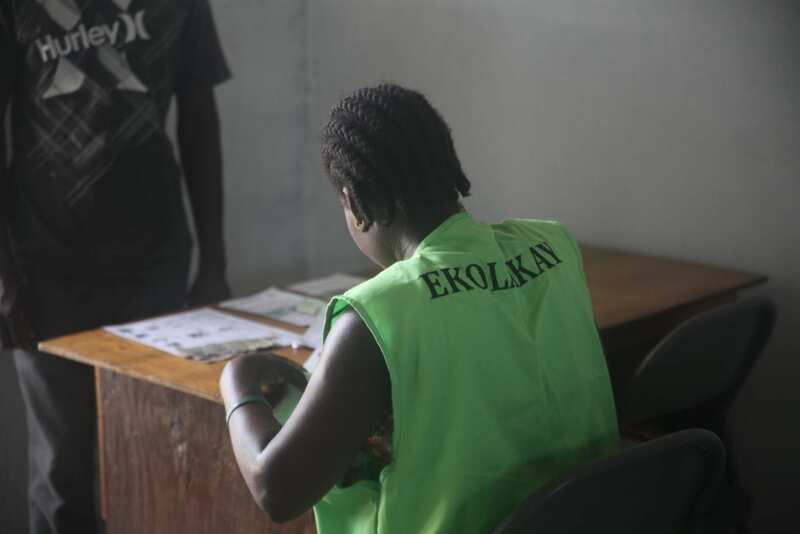 The global professional services firm EY, who has worked closely with fellow CBS practitioners Clean Team Ghana, supported SOIL to help ensure that EkoLakay’s model can be scaled up responsibly across Haiti. Two EY consultants from Enterprise Growth Services, the non-profit program which extends EY’s services at heavily discounted rates to impact entrepreneurs in low and middle income countries, arrived from London earlier this year armed with an enthusiasm for SOIL’s mission and extensive private and social sector expertise. We’re excited to share the encouraging preliminary results of their report, which are helping refine EkoLakay’s strategy for the coming years. EY mapped out potential business outcomes if EkoLakay’s customer base were to grow from its current size of around 1,000 customers to a base of tens of thousands of users. 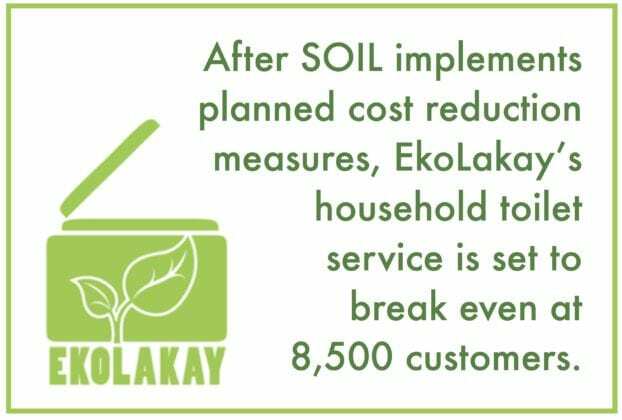 It is projected that, if SOIL implements planned cost reduction measures and captures economies of scale, EkoLakay’s household toilet service is set to break even at 8,500 customers. This means that with that size of customer pool, the low monthly fees that families pay to have a private EkoLakay toilet in their home would cover all direct and indirect costs of providing the service. After observing EkoLakay operations and conducting interviews with SOIL staff, EY analyzed a list of SOIL’s proposed operational modifications to increase EkoLakay’s efficiency and projected the impact of those changes. Though there’s much work ahead to achieve full financial sustainability, EY’s report is a ringing endorsement of SOIL’s ability to grow EkoLakay into a fully sustainable social business that could then be replicated across Haiti – and potentially across the globe. As we had expected, when waste treatment services were considered alongside EkoLakay’s household toilet service, there was no breakeven point in which the revenues from customer payments and compost sales could cover all operating, indirect, and capital costs. This reflects what we know to be true: that safely treating human waste is a costly process and a public good. Waste treatment is a service that is heavily subsidized by governments in most countries around the world because of the critical role it plays in protecting public health. Thankfully EY’s analysis showed the level of subsidy required to manage SOIL’s waste treatment fell to affordable levels with scale. With 5,000 households using EkoLakay toilets, the annual required subsidy per customer was less than $10 USD, which fell to an annual rate of just $5 USD per person with a customer base of 40,000 people. Although comparisons are currently limited due to different research methodologies, a yearly subsidy of $5-10 per person is far cheaper than the sanitation options considered by a recent study in Dakar, where septic tank and sewer based systems annually cost $12 and $55 per user, respectively. SOIL is actively pursuing long-term funding sources to ensure that, no matter the level of subsidy we are able to achieve, we can bridge that gap and continue to treat and transform 100% of the wastes from SOIL’s EkoLakay toilets. EkoLakay has already begun field-testing EY’s recommendations for refinements to our service delivery model that will likely have the biggest impact on our bottom line, like implementing mobile payment mechanisms. This coming year, SOIL will keep an eagle-eye on costs and monitor progress based on a range of key performance indicators. We’re excited to continue growing and refining EkoLakay, demonstrating the potential for container-based sanitation interventions to provide cost-effective, climate-resilient sanitation in Haiti and beyond. No Replies to "Global Consultancy Firm Supports EkoLakay's Preparation for Responsible Scale-Up"